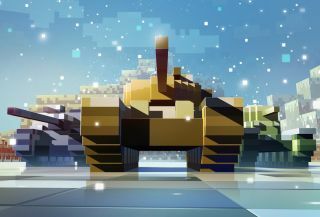 World of Tanks goes 8-bit in "Winter Showdown"
"Winter Showdown," the upcoming new game mode for World of Tanks, sounds like fairly conventional stuff: You put the tanks in the snow and boom, it's a showdown in winter. But this is actually quite a bit different than you might expect, because it's not an ice-encrusted, Eastern Front-style armored brawl. It's an 8-bit mode. The trailer does look wintery, but even more than that, it looks like somebody recreated the game in Minecraft. There's more to the new mode than just the blocky graphics, though, as Winter Showdown adds "mega platoons" supporting five players instead of three, and new gameplay modes including two-on-two mega platoon battles, and 10-vs-10 random battles. The add-on will also bring a trio of new tanks to the party: The close-quarters Mammoth heavy tank, the long range Polar Bear tank destroyer, and the quick Arctic Fox light tank. There will be a new battle arena, an Operation Winter medal, and as is appropriate for this more old-school style of multiplayer tank battle, players will be able to heal their teammates by shooting them with special gold ammunition. Winter Showdown goes live on January 26, except in Korea, where the action will begin on January 15.